Extra mains allow you to create extra entry points to your code base. This is helpful for running things like tests, Devcards, and other top level applications in the same codebase. Extra mains have the advantage of running in the build that declares them. This makes them much lighter and simpler than running background builds. It also means they all share the same broadcast updates when a file changes. In other words when a source file changes all of the extra main apps get the change message, but the namespace is only reloaded when it is in the app’s dependency tree. The best part of the extra mains feature is that Figwheel provides default web endpoints and you can easily use them without having to create a host page. Let’s look at an example of using an extra main, so that we have a better idea of what it is. I’m going to assume that you already have a project set up. I’m going to continue to use the hello-world.core project that I’ve been using so far in this documentation. We are going to add some basic tests to our project. Everything will start like usual. But if you check your target directory you will have a new output file. In this example it would be target/public/cljs-out/dev-main-test.js. This output file will work just like the target/public/cljs-out/dev-main.js output file except that it will run the code in the hello-world.core-test namespace. At this point you would normally need to create a host page for this new main file but you don’t need to do that because you can visit the /figwheel-extra-main/tests endpoint on your Figwheel server. 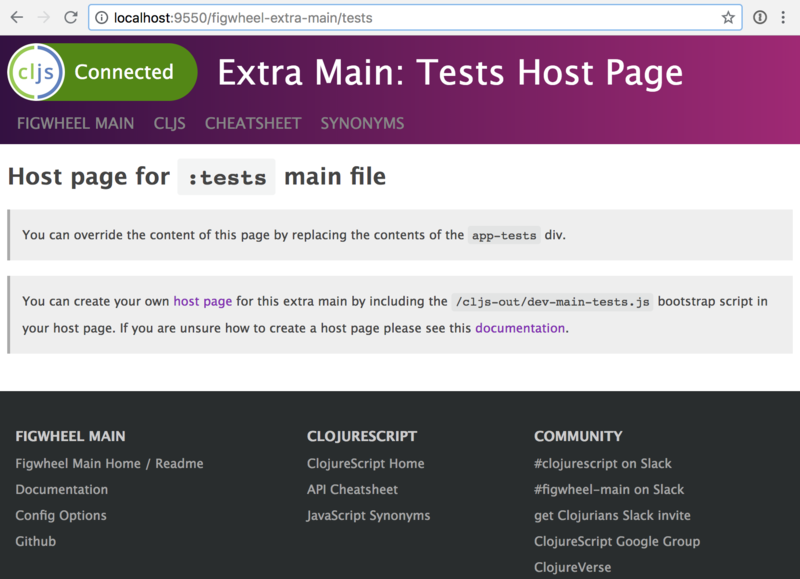 If you open the console you will see the test report from cljs.test. As you can see you now have a different application that is being output from the dev build and it has its very own endpoint. Well, if you are working on an application and you want to have the tests visible in another tab of your browser and you want them to re-run after all source code changes, this is an ideal way to do that. You could do that with a background build but in that case you have two autobuilding processes running in parallel on the same codebase which is much more taxing on your CPU. You don’t have to use all of the main entry points at the same time. But they are there, waiting to do your bidding. Not only do extra mains lighten the compile load, but because they are all within a single build this also allows for extremely simple REPL focus switching. The application loaded by the extra main entry point will behave the same as the main in terms of its relationship to Figwheel. In other words, the extra main will connect to the Figwheel REPL and get reloads just like the main build. This feature will only output the additional ClojureScript bootstrap file that you will require on your host page, it will not cause any additional files to be compiled. You will need to make sure that you have added all the needed source directories to your :watch-dirs and to your classpath. If you add an extra main entry point but don’t supply its source files to the compiler this feature won’t work. You will be able to find the default endpoint for your extra main at /figwheel-extra-main/[extra-main-id]. I.E for :tests the endpoint would be /figwheel-extra-main/tests. There is a div on the default host page where you can mount your application. The app div on the page does not have an id app but rather app-[extra-main-id] (for :tests that would be app-tests). This is so that you can conditionally mount applications by testing for the presence of a certain div id. I.E. you can belay starting your main application if the app div isn’t there. This would allow you to require the namespace that mounts your main application and test the functions in it even if it has top level code that tries to display itself on the page. :extra-main-files will only work under :optimizations level :none. As you can see from the above example when you configure :extra-main-files you pass it a map of name keys mapped to ClojureScript options maps. These maps are merged with the options map that Figwheel has already modified and may have injected various :preloads and :clojure-defines. This of course creates a problem if you want to add more :preloads or :clojure-defines. :extra-main-files handles this by allowing you to add more :preloads by supplying an :extra-preloads key. You can do the same with any ClojureScript key that has a collection value. The options that you supply do not affect how your code is compiled, they only affect how the final main entry file is generated. The following options are the only ones that affect how this file is generated. You can supply an explicit :output-to path but Figwheel will supply one based on the current :output-to. It will add an "-[extra-main-id]" to the end of the file name before the extension. For example, if there is already an :output-to file named target/public/cljs-out/dev-main.js, Figwheel will rename that to target/public/cljs-out/dev-main-tests.js if the name of the extra mains config is :tests. The Figwheel REPL allows you to switch focus between environments (think open tabs) as long as they are in the same build. You can use the figwheel.repl/conns and figwheel.repl/focus macros from the CLJS REPL prompt to do this. There is a very simple technique for switching the focus of your REPL though. Reload the browser tab if you want the focus of your REPL to switch to that environment. The Figwheel REPL will focus on the last environment to connect to the Websocket. So to switch focus just reload the browser tab where you want to focus. You verify this with a (js/console.log "focus is here"). You will see that REPL focus follows that last tab to open within a build.